Don’t know what to make for dinner? When you’ve come to rely on convenience foods, it can seem like there’s “nothing” to eat, when really it’s just that nothing easy jumps out at you. 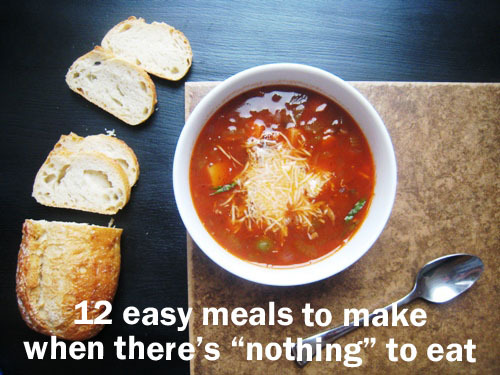 This list of easy meals will change that. Don’t think you have time to make dinner? Too tired to cook, but don’t want to eat out? Think that there’s “nothing” to eat in the cupboards? When you’ve come to rely on convenience foods, it can seem like there’s “nothing” to eat, when really it’s just that nothing EASY jumps out at you. It doesn’t have to be that way. One solution is to have a meal plan and stick to it like glue. Another is to create a list of EASY MEALS that come together quickly from ingredients that you regularly have on hand. In this way, when you don’t want to or can’t follow your meal plan, you have a Plan B to fall back on. Make a list of your family’s go-to meals, meals that your family loves, that come together quickly, and can be made with stuff you typically have in the fridge. Tack this on the fridge. Consult it when you go grocery shopping and keep on hand the ingredients you need to make these meals happen. When you think there’s “nothing” to eat, turn to this list. Here are some family-favorite meals that can fit any budget. They are super flexible and allow you to make use of affordable pantry staples. Best of all, they come together in 30 minutes or less. Rice Bowls are so easy and versatile. Depending on what kind of rice you typically make, dinner can be ready in 20 to 45 minutes. Cook some rice, assemble your toppings, and dinner is pretty much ready. Ingredients needed: rice, protein (cooked meats, beans, shredded cheese), vegetables (fresh or sauteed), toppings (cheese, salsa, sour cream, Asian dipping sauces). 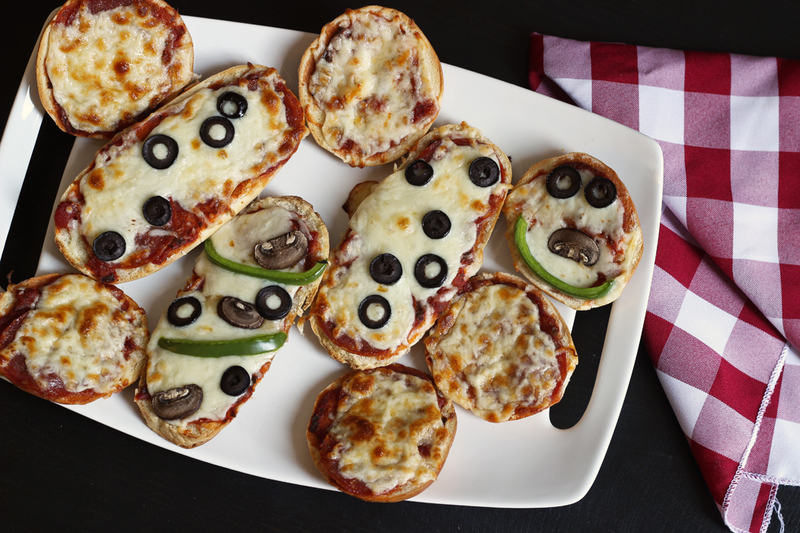 See the recipe post for more ideas of toppings. Pasta is a super cheap pantry staple that cooks up in about ten minutes. And believe it or not, it’s super simple to make your own sauce. Homemade sauces are very freezer-friendly so it’s easy to always have a pint or two in the freezer. 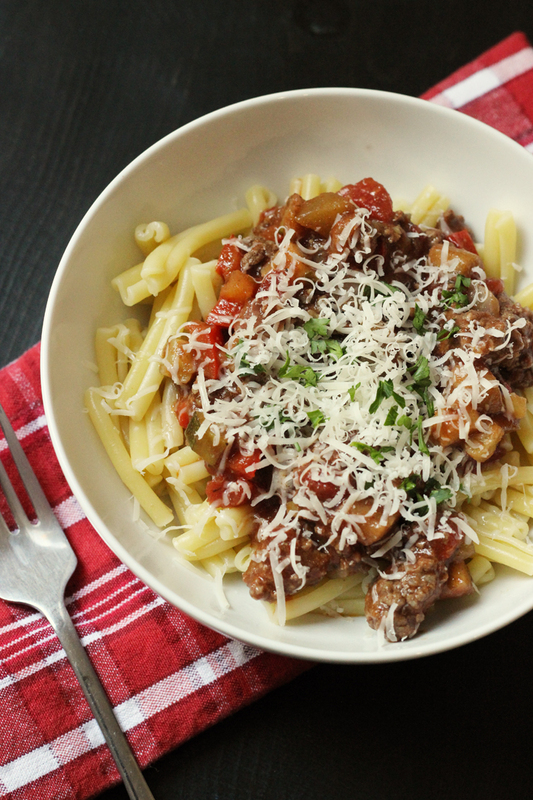 The sauce thaws quickly in a pan on the stove top, and pasta can be cooked in a jiffy. But, even without a frozen cache of sauces, you can make any number of pasta dishes in a matter of minutes with what you’ve got on hand. Ingredients needed: pasta, red sauce, a veg or two to serve on the side, Parmesan or Asiago cheese for sprinkling. Quesadillas are a regular stand-by around here. If hubs and I go on a date night, this is an easy meal the older kids can make themselves. There’s little prep work, and clean up is a snap. We adults prefer a little something more than just cheese and tortilla, so I often add grilled meat or chicken or some sauteed vegetables to make it a little more. Salsa and sour cream are favorite for dipping. 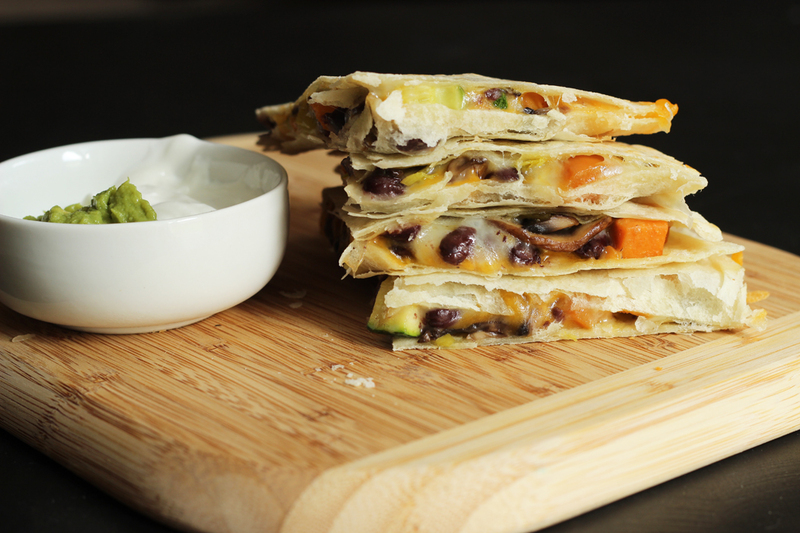 This black bean and sweet potato quesadilla is amazing! 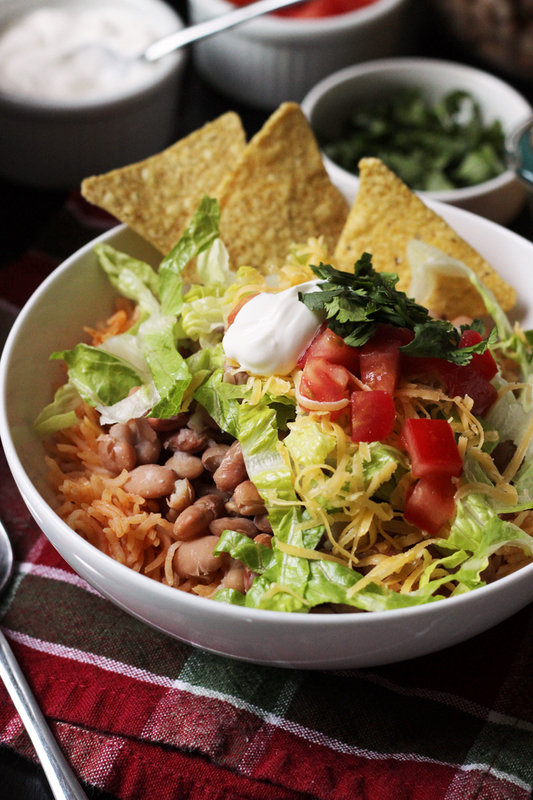 Ingredients needed: tortillas, shredded cheese, sour cream, salsa, cooked meat or vegetables for extra filling. The breadier counterpart to the quesadilla is the grilled cheese sandwich. These come together in a flash with a panini press or an electric griddle. I keep bread in the freezer for this kind of meal. Cheese is a major staple in our fridge. Serve with fruit or veggie dippers on the side. 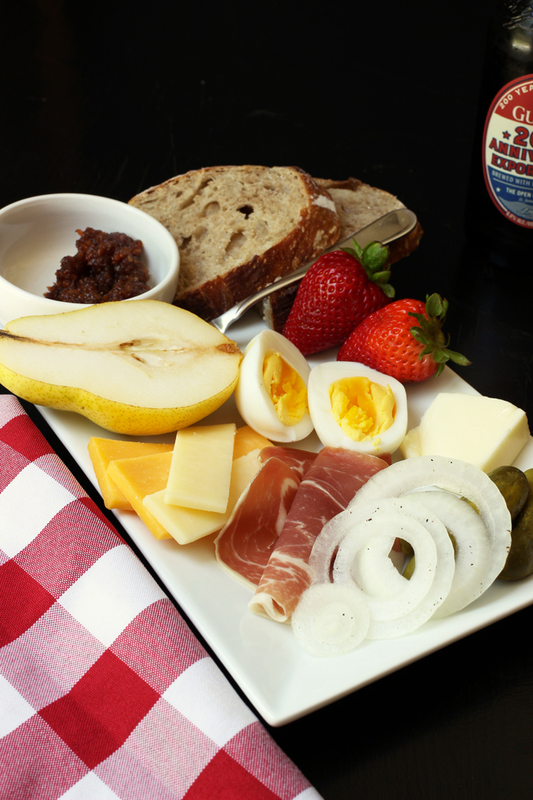 On warm weather days, a sandwich bar is an easy way to please the masses without heating up the kitchen. I slice up whatever veggies and pickles we have on hand as well as cheese. For extra protein you can add a few cans of tuna or whatever cooked meats you might have on hand. Ingredients needed: bread, cheese, meat, veggies, fruits and veggie dippers. 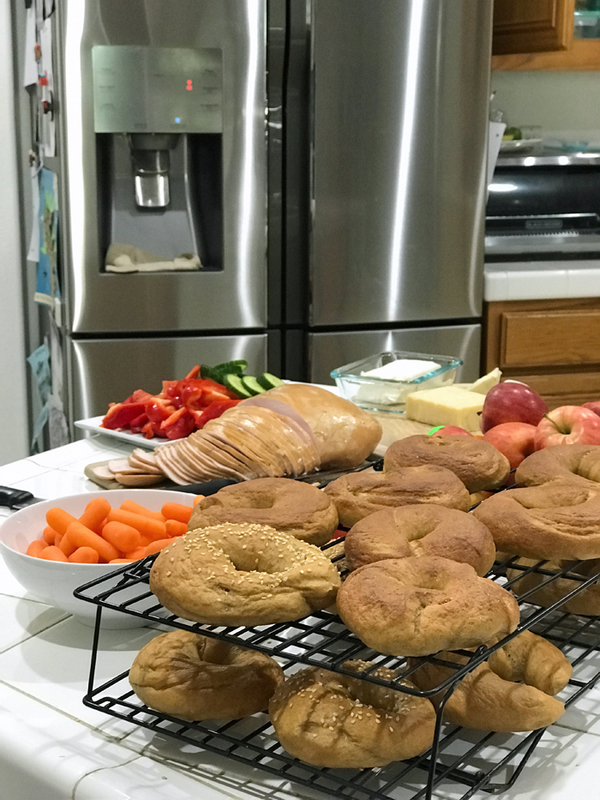 Snacky Lunch or Snacky Dinner is an old standby for our family, especially when there are baguettes to be had, homemade or otherwise. These no-cook suppers count for snacky as well. We sometimes serve this on purpose for special occasions, like New Year’s. But, if it’s just a regular old week, I’d dig around in the fridge until I found enough mocktail/cocktail foods that would fill people up. You’d be surprised with what you can come up with that is still fun. Ingredients needed: cheeses, meats, nuts, seeds, fruits, veggies, bread, crackers, pickles, olives, other appetizer kind of foods. Put your favorite pizza toppings on a tortilla, bagel, french bread, pita, or even an English muffin and run it through the broiler for a quick Tortilla Pizza. This is so easy, it’s not even funny. Ingredients needed: tortillas, cheese, favorite sauces and toppings for pizza. Ingredients needed: pancake mix, eggs, hashbrowns, cereal, and/or oatmeal. 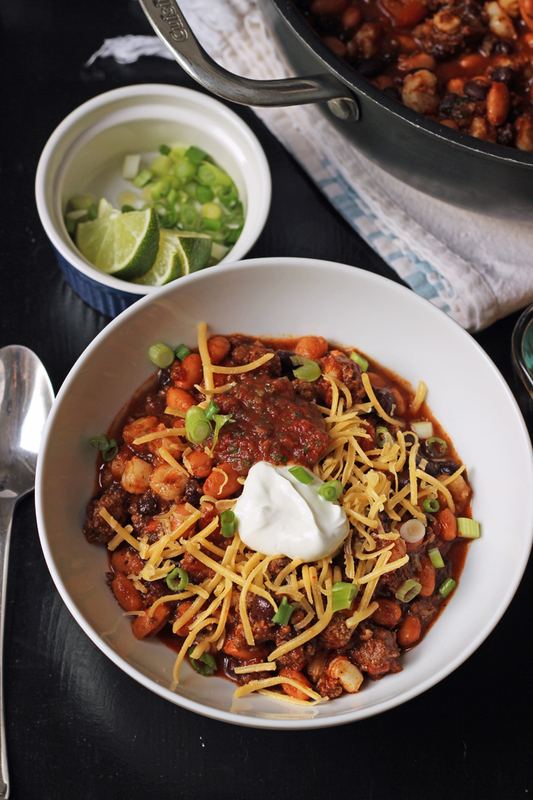 Chili can be such a comfort food. It’s amazing how quickly a bowl of red can come together, about 20 minutes for The Quickest Chili in the West. Add cheese and sour cream and chips for a filling supper. Wrap the leftovers up in tortillas a night or two later. My kids love this stuff. 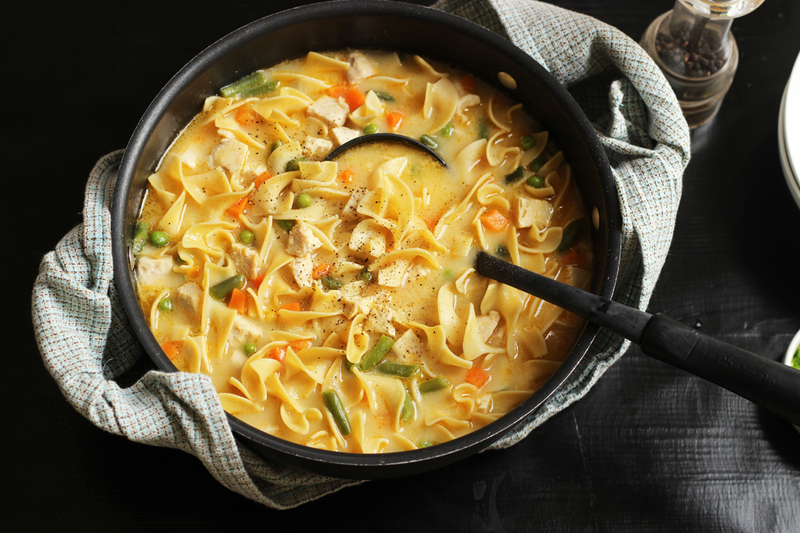 They have rarely had the canned version because this Chicken Noodle Soup is so easy and economical. If you keep cooked chicken in the freezer (or buy canned) it is an easy weeknight supper. It’s also a great way to use up leftovers from a roast chicken or turkey. 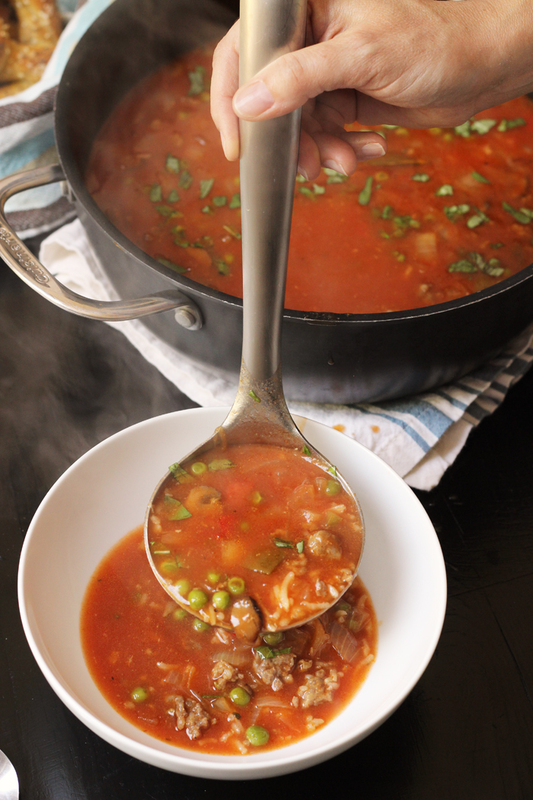 Making soup from leftovers is one of the easiest meals to pull together. Thursday Night Soup, a recipe of Jacqueline Heriteau offers the direction you need as well as the freedom to improvise. You really can make a tasty soup from almost nothing. I originally posted this Easy Nacho dish as an appetizer, but it can really double as a meal. At least in my book. It takes so few ingredients and comes together in a flash. Chances are you’ve got some family favorites built around staple ingredients. Write those menu plans down so that you have a catalog to draw from. Don’t worry if they don’t seem like a “real meal”. Neither does a Big Mac. Having this list of 12 Easy Meals to make will help you get over the rough patches when dinner doesn’t seem like it will happen any time quick. What’s an easy meal YOU make? Tell us what’s on YOUR list so we can add it to ours. Favorite fast meals at our house include veggie frittatas, pasta with garlic oil, veg and chicken, and a homemade version of that traditional canned tomato soup that we used to love, but don’t eat anymore because of the ingredients. 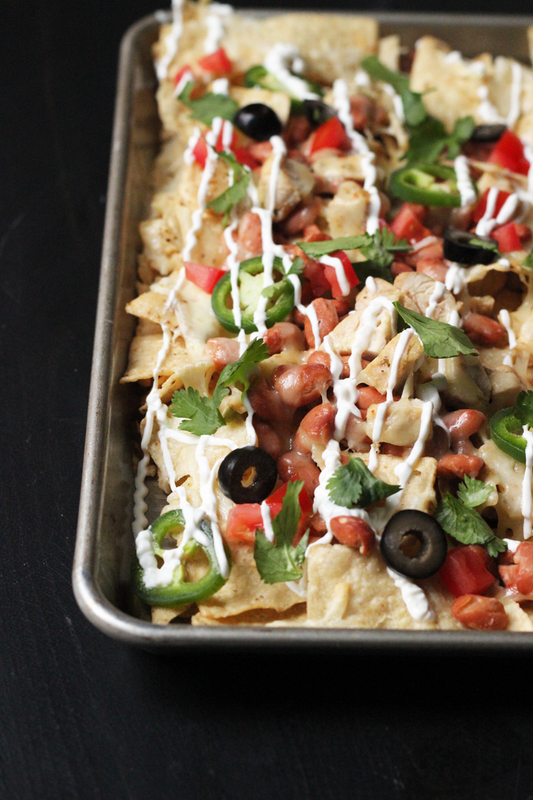 Oh, and nachos…we could eat nachos any day. I know it’s not as healthy, but I always have a frozen pizza in the freezer as a backup. Because often when I’m feeling run down and too tired to cook, I want pizza. You could easily have the ingredients to make your own. Thanks so much for the worksheet and making me sit and do this, because it’s inevitable that this will come up. Thanks for the options! 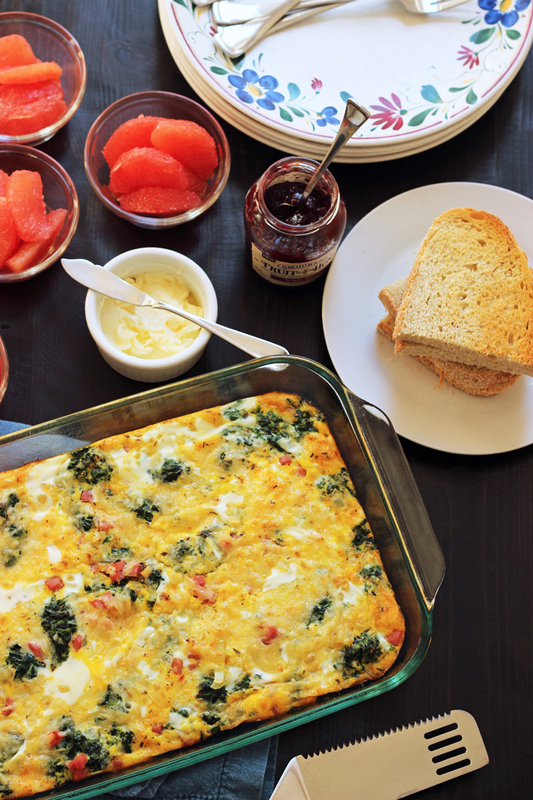 We enjoy breakfast for dinner and quesadillas as fast fixes, but it’s always nice to have other ideas. Our goal is to eat out only once a week as a treat and get more whole foods in, and eat better. It seems ti be working and the kids are eating better! Homemade Pizza is one of my go-to quick meals…and pleases all members of the family! I keep homemade dough, marinara, and shredded cheese in my freezer for those crazy days. Grilled sandwiches are on our list too. Thanks so much for these great ideas and the worksheet. This is a crazy, busy week for us—long orthodontist appt. (braces off!! ), hair appts., dr. appt., 5lbs. of apples to process into applesauce. On top of all that I’m getting ready to leave for two weeks. Boy do I need easy meals! I already have breakfast for dinner and chili on the menu. If I have cooked chicken in the freezer, chicken enchiladas come together in a hurry. Cheese pizza is a good option too, as Julie mentioned. Your simple bean tostadas come together in a hurry, and crustless quiche is great for using up leftover bits of meat, rice, and vegetables. This is a great list! I normally do a monthly menu but ran out of time at the beginning of the month and only got half way done; so now here I sit wondering what to make. This was very timely and I think we’ll be having quesadillas tonight after swim lessons. 🙂 I never thought to make those before. Pre-shredded cheddar cheese and tortillas are staples in my kitchen and I just happen to have some canned chicken in the cupboard. Easy peasy…thanks for the ideas! My brother is a sheriff working in a county jail and he said the inmates do make interesting concoctions with the things they buy from the jail store. This sounds right in line with what he described. LOL! Love this post! 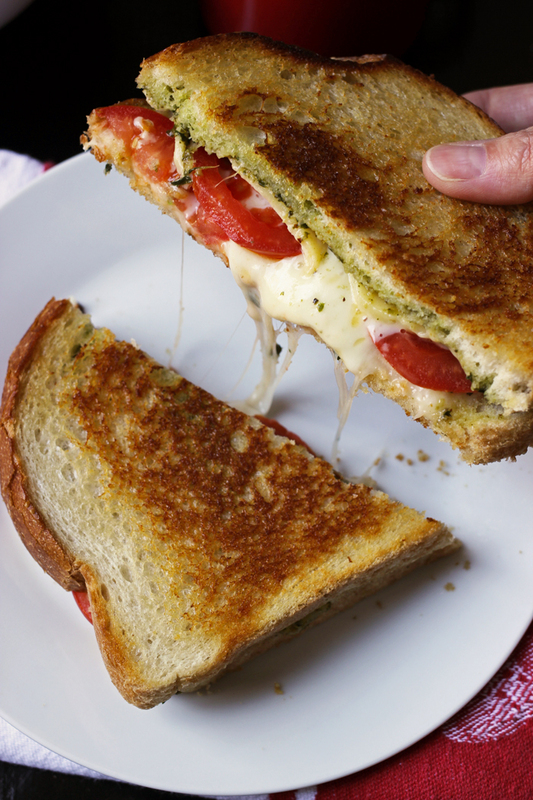 Some of our favorites include Caprese grilled cheese sandwiches (Butter outside of bread & sprinkle with garlic powder. Layer on shredded mozzarella, basil ribbons, thin slices of tomato. Yum. ), English muffin or pita pizzas, quesadillas (regular or Greek), onion pepper pasta or bruschetta pasta and Dutch Babies (http://www.food.com/recipe/means-dutch-babies-45609). Thanks for the printable list! Great idea. Like lots of other folks, around here we rely on grilled cheese sandwiches, quesadillas and breakfast for dinner (eggs, waffles, or pancakes) when there is “nothing” else. Just last weekend we had to fall back on grilled cheese and tomato soup when I found that I was out of yeast to make my homemade pizza dough. Oh, well, dinner was served and no one went to bed hungry; yeast is on next week’s grocery list! @Renee, it’s so easy to get caught up in making it just right, when “good enough” fills the bill just as well. Love these suggestions. Need to remember the breakfast for dinner next time. This is a very helpful post. I know you’ve done a post in the past either here or at Life as Mom about meal suggestions for when you are on a budget. Would you be able to share that link? @Karen, I’ve done so many of those, I can’t really point to one. It’s such a constant conversation on both GCE and LAM. I always keep a can of sliced potatoes and wax beans to make a creamy comfy soup. The rest of it is just a basic white sauce with onions, S&P and a touch of nutmeg. Love your stuff! Been sharing various posts at the Meal Planning group at CafeMom. @Kelly, thanks for sharing the love! Thanks for the list! I’ve been running out of ideas. pasta & sauce is a back up; either a white, red, or a simple egg yolk like carbonara (typically without the bacon). I use ground turkey or chicken breast for the protein. something mexican-y with rice, beans & whatever meat & spices. I’ve started buying the 10 minute brown rice instead of the long grain white rice that takes 20 minutes. My fam was complaining about having rice, beans, tomatoes & chicken for the 3rd time in less than 2 wks so I tried making a tortilla soup out of what I already had cooked. Turned out pretty good, but would have been better with the long grain rice. I can’t believe no one listed mine and my Mom’s favorite, biscuits and gravy.A quick 30 min meal and my guy’s love it. Hi! Thank you so much for your ideas. Love it. We are so busy that if I forget to put something in for dinner then it’s hard to find the energy & time to cook. However if you think of it as dinner can be ready in 20 mins for pennies on the dollar of eating out it makes it simpler. Also, by the time you go get it, wait for it & get home it’s more than 20 mins. I have two suggestions to share. The first is in line with your meal plan. A friend of mine gave me this clue. I have a family of 5. Two of us are celiac and lactose intolerant. So it makes eating out harder for us. Even ordering things gluten free such as hamburger wrapped in lettuce can make us sick because of cross contamination. So we do have more incentive to not eat out, kind of forced actually. It’s only been 6 months so we are still adjusting. If you don’t have health reasons think of the unhealthy things your eating when you go out & the amount of calories because of the unhealthy things. Anyway, back to the idea, pick a meal for each day of the week. For instance Monday is meatballs/meatloaf/or stuffed peppers, Tuesday is chicken fingers, Wednesday is crockpot, Thursday is sandwich/soup night, etc. Design it based on your schedule. Easy dinners for busy nights etc. I actually have it repeating in my phone calendar. It may sound boring, but it’s not. I’m not super stringent with it. I switch the days, if I change something or we eat out I change my calendar so I can keep track. I have a white board on Fridge with the schedule. I buy a cooked rotisserie at Costco for under $5. We eat it for dinner one night with sides. Then I throw it in my crockpot filled with water & spices the next day. When it’s time for dinner I strain it to remove all but broth, I throw in the noodles in broth, pick meat off bones, add some sautéed onions, celery, leek, etc. or you can cut them up & microwave them & throw them in. It makes for two very inexpensive easy dinners. This is just what I needed. We have just started on a Total Money Makeover, and my husband was just saying, “We eat the same thing everyday.” Which, is not too far from the truth. I needed this to not only be organized and frugal, but to be a bit more creative with our usual fare. Thank you. My family’s go-to for a relatively quick meal (and a way to use up all those darn leftovers) is “roadkill bread.” You mix together all of your leftovers (within reason…don’t add anything too soupy or flavors that really clash, but even mixing Italian and Chinese leftovers can work) in a heavy-duty wok or other all-metal pan. Cover with cornbread batter (we use Jiffy) and bake until the cornbread is cooked. If you don’t want to use leftovers, a mixture of vegetables (onions, peppers, broccoli) and some kind of meat (chicken, sausage) quickly sauteed and seasoned however you like makes a great base. A favourite of ours is to use up mashed potatoes. Add grated cheese, left over chicken, ham or bacon and vegetables and make into croquettes coated in flour, egg and bread crumbs. (breadcrumbs are of course routinely made from left over or stale bread and stored in an air tight tin, once baked till completely dry) These are then fried till golden in the deep fat fryer. They are so good and tasty my son calls them “God sticks”. Cold mash forms into shapes, croquettes or small balls, much easier than warm. A great way to use leftovers or make a meal from scraps in the fridge. They can be served with sweet chilli dip or a flacoured mayonnaise or with a tomato sauce. These meal ideas look amazingly delicious and easy. I can’t wait to try some! 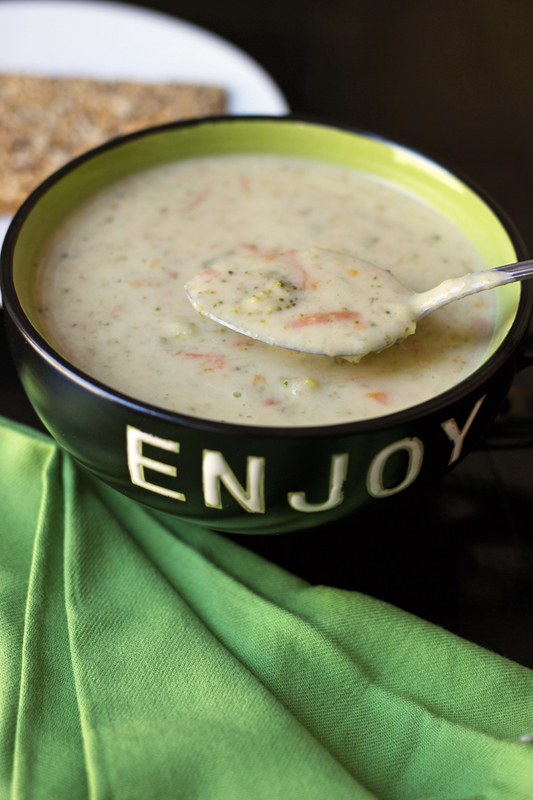 Another favorite of mine is basic potato soup. All you really need is potatoes and broth, and I’ll usually use sauteed onions and garlic as well, and then sprinkle cheese on the top. And obviously, you can add various other things, like sour cream and bacon, depending on what you’ve got on hand. Thanks for this link from your cantry post. My oldest is heading off soon for her first college apartment experience. She asked me to assemble a binder of recipies for her. Printing off the template now to be filled with poor college student ideas. Thanks. We do more or less the same. Sundays and Wednesdays are fish, Fridays are burgers and movie night, Mondays are soups and Saturdays are pizzas. Tuesday and Thursday s are usually chicken and a pasta or Mexican dish..
My go-to quick dish is Quinoa and Black Beans (http://allrecipes.com/recipe/quinoa-and-black-beans/) It comes together in about 30 minutes and we top it with sour cream, cheese, salsa, green onions, avocado…really anything you have on hand. It’s so healthy and my kiddos love it! along with grilled cheese and breakfast, we also do baked potatos with bacon, cheese and chives. I also like to make huge batches of black beans in my crock pot and store in the freezer. We pull that out and make bean-cheese burritos in a snap! I also precook lots of hamburger with beans into taco meat…it defrosts really fast for tacos quick! I had to laugh when I saw your Thursday Night Soup. When I was growing up it was called STOUP–it was not stew and it was not soup, but it was always good! With “nothing to eat” for lunch yesterday, I found a box of Trader Joe’s tomato soup. So that was my canvas! I sautéed a diced red onion in olive oil and salt, when translucent I added three chopped garlic cloves (yep, THREE cloves!). I had three small yellow tomatoes from the farmer’s market so I chopped those and threw them in along with eight torn fresh basil leaves and freshly ground white pepper. I discovered I still had some fresh dill and fresh parsley so I chopped that up and threw it in along with the box of soup. While that was warming I called my neighbor and asked if she still had some of the ciabatta from the farmers market. She did ~ so I invited her over. I served the hot chunky soup in big bowls with slices of ciabatta and freshly grated pecorino cheese and pepper. Yum. Our favorite quick dinner is garlic bread dipped in my homemade marinara sauce, with something throwed together for a salad and cookies from the freezer we had prepared earlier for times like these. You just saved me from certain starvation!!! Thanks a bunch. Carbonara. Simple, pasta, bacon, eggs, parmesan or romano cheese, garlic, salt and pepper. It goes together quickly and tastes great. Lots of recipes online including from Emeril and Rachel Ray. Quick, inexpensive and creamy with no cream. Kids love it. One of my go-to quick and always on hand meals is a hot sandwich…..Don’t know where I got the recipe. Split English muffins and toast very lightly. Mix ham cubes…small, mayo, finely diced onions, and shredded cheddar cheese. Spread on the muffins and bake in over until lightly browned on top. Serve with credited or soup or small salad. and sour cream if you have it. I also make a Greek version with spinach and feta. Another good pantry dinner is to make an Asian peanut sauce for spaghetti. Mix peanut butter with soy sauce and a bit of sesame oil. You can add garlic powder and some honey or brown sugar to taste. Make it Thai by adding a couple of Tbsp. Ketchup.Mix and add to cooked spaghetti. You can add veggies such as carrot broccoli red pepper or scallions. What’s funny is that these meal ideas are all my usual weekly meals. Economical and easy to whip together! I like to keep chopped rotisserie chicken in the freezer. I can make so many quick meals with that! Pad Thai noodles, Asian chicken salad, soup, chicken macaroni salad, to name a few. Thanks for sharing! what we do if there is little in the house is cook whatever pasta there is and whatever shape….it doesn’t have to match…..then whilst that is doing, get whatever veg you have and chop and fry in whatever oil we have. onions/courgette/peppers/celery/green beans……..whatever. After veg and pasta are ready, drain pasta and return to saucepan, add veg and mix….then add beaten egg and return pan to heat stirring over low flame. When nearly done, add any cheese around…one final stir and serve. Can be served with salad/bread/alone. I made a really great soup with Ramen chicken flavored and added garbanzo beans, a packet of cheese from a mac and cheese box and a can of chicken and corn. That was Fridays dinner. Saturdays lunch was leftover soup with leftover hamburger from Thursdays meal with added green beans and 2 cans of chicken noodle soup. It tasted great and it all got used up. Sounds like a great mix! Ten of the 12 are our go-to easy meals:) Tacos is a weekly item, as well. Thursday night is clean the fridge night ( Friday is trash pick up ). Any leftovers or soon-to-go-bad produce get made into soup, casserole, frittata, or hearty salad. Since I just went through the fridge, I know what groceries to buy on Friday. Less waste and more efficient shopping since I started doing this. We like breakfast for dinner…pancakes, hashbrowns, eggs. Also easy to chop up some potatoes and fry them up with sausages and eggs or make it into a frittata with greens. When we make chili, the next night we make a box of KD and then mix the leftover chili with it, so good. I could also see chili being tasty on toast. Spaghetti, a tin of tomato, and cheese can do wonders. Just cook the spaghetti, meanwhile heat the tomato in a saucepan with a teaspoon of sugar, salt and pepper, and spag bog herbs. Chuck on a plate/bowl and top with grated cheese. The best! And only two main ingredients, which can both be kept in the cupboard in multiples indefinitely. The chicken noodle soup looks so good!!! another alternative is the INSTANT MIX blended in TOMATO (Canned / Jar) – takes 60 mins..but worth it for 2 days. YUM! Tasty and warmth for the WINTER and COLD DAYS also good for you. That is all stuff that you can’t make out of nothing. What do you make when there is barely any food in the pantry and no food in the fridge or freezer? True, the “nothing” to eat is tongue in cheek. However, when supplies are low, this is my go-to: https://lifeasmom.com/thursday-night-soup/ It’s super versatile and lets you mix and match what you do have.